Seattle Seahawks running back Marshawn Lynch may not have much to say to the press, but his teammates Richard Sherman and Doug Baldwin sure do. They held a bizarre press conference Tuesday night to make fun of the NFL's media policies, which have hurt Lynch and gotten other players in trouble, especially when they talk about brands other than league sponsors. 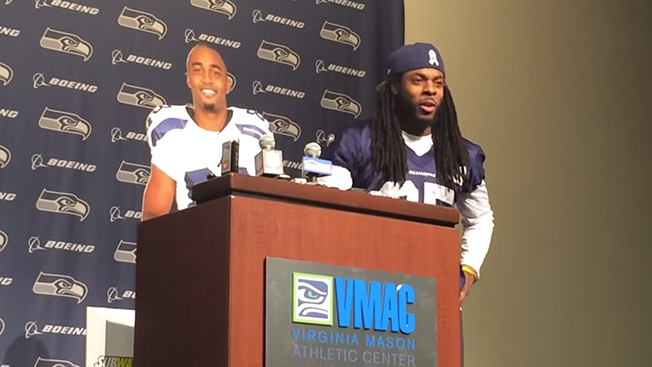 Sherman and a cardboard cutout Baldwin (propped up and voiced by Baldwin himself) appeared at the weekly press conference. The duo performed a skit lampooning the NFL for forcing players to speak to the press, but then limiting what they say about non-sponsor brands. Satirically name-dropping sponsors like Martinelli's, Subway and Campbell's Soup, the players accused the league of forcing them to act as mouthpieces without paying them, and then restricting the athletes from promoting the brands they have side deals with outside the NFL. "It's fun to use your time in the NFL for something you care about, right? Then you don't get fined $100,000. You don't get fined at all for this. This is how they want us to talk. This is what they want us to do. They want us to advertise, right, Doug?" Sherman joked. The biting press conference was staged in protest of Lynch's $100,000 fine issued by the NFL for failure to fulfill his obligations of speaking to the media. (The running back left the locker room without talking to the press, but called two NFL Network reporters to talk.) Lynch retorted by making himself available after last week's game against the Arizona Cardinals—but then brilliantly responded in one-word quips. Sherman's diatribe also was in response to multiple incidents pitting players against the NFL and its sponsors. Recently, San Francisco 49ers quarterback Colin Kaepernick was fined $10,000 for wearing pink Beats by Dre headphones during a press conference. (The league is sponsored by rival Bose.) Kaepernick, who is sponsored by Beats, claimed that he wore the headphones in order to promote breast cancer awareness. He did not say whether Beats paid the fine on his behalf. In addition, players are supposed to use the Microsoft Pro Surface tablets—or as Chicago Bears quarterback Jay Cutler calls them "knockoff iPads"—due to a $400 million sponsorship deal with the tech company. The athletes don't seem to be fans, especially since the devices keep dying, The Wall Street Journal reported. As ESPN pointed out, countering Sherman's argument, the players do benefit from NFL sponsorship deals. Athletes get 45 percent of the money generated from the agreements, which are added to the salary cap. So, while Sherman and Baldwin should have the right to argue things they feel are wrong without getting penalized, it's not like they're going home empty-handed after chatting with journalists.